With all eyes on the big two in the market, not enough people are giving American Standard the respect that it deserves. A surprising award from a well-known magazine may have boosted its profile temporarily, but people still don’t consider the toilet industry as topped by a “big 3” with this company included. However, American Standard is far from generic, and has some surprising deals for customers that want to add a new toilet to their home. Their products are easy to install, have the necessary features, and most importantly are the lowest-priced options available on the market; all this with quality intact and the longest warranty in the industry. Below are some of the best options from American Standard, many of them current bestsellers. The Champion 4 is a one-piece ADA-approved elongated toilet that doesn’t come with a seat, so you can choose which one is best for your needs. Buttons on the toilet are chrome-plated and clearly marked so that the user knows what type of flush they are going for. The Vitreous china construction adds to the durability of the toilet, with a power wash rim that destroys any waste in the bowl with each flush. Choosing round or elongated won’t affect the right height settings, and it retains maximum comfort even if you choose the smaller round size. This WaterSense-certified product uses 1.28 gallons per flush and won’t disappoint customers with its power and efficiency. With a concealed trapway and the siphon-action jetted bowl, you get a combination that keeps things looking professional inside and out. First up on the list is a model from their premier Champion series. This high-priced Champion 4 is available in white and linen, both colors adding a nice pop to any bathroom they are put in. The Champion 4 is a one-piece ADA-approved elongated toilet that doesn’t come with a seat, so you can choose which one is best for your needs. It is made of a mash-up of vitreous China, and primed with an EverClean surface so that bacteria, mold and mildew can’t grow on it. It also gets rid of the odors and stains caused by those harmful bacteria. The right height design technology is comparable to that of Kohler’s Comfort-Height toilets, and gives any user the most comfortable sitting experience possible. Unlike other brands, American Standard offers a decade-long worry-free warranty on most of its toilets, so customers don’t have to worry about things going wrong and being out of contract. Water consumption is industry standard at 1.6 gallons per flush, and a flush will take down any waste that is in the bowl. This is a great start to the list, as the Champion series is the flagship series for American Standard and well worth the buy. In the lower price range is this model from the popular company, available in round or elongated sizes. Colors you can choose for this model are white, linen and bone. The best color in the lineup is bone, but white is the most neutral of the three. This is the first dual-flush toilet on the list, and it is also the first toilet to combine that feature with siphonic action to give customers the best flushing experience possible. Buttons on the toilet are chrome-plated and clearly marked so that the user knows what type of flush they are going for. Because you can switch between low and high power flushes, it is a WaterSense-certified model and is very good on your water bill compared to a traditional toilet. 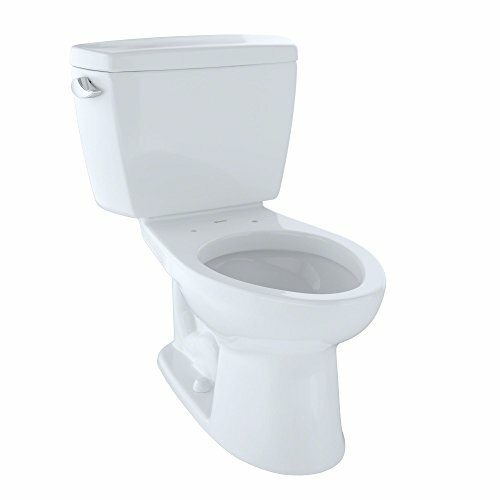 Whether you choose the 1.6 or 1 gallon flush, waste will be thoroughly removed from the toilet, and won’t come back up. The warranty for this product is 5 years—that of the first product on the list cut in half. Even at that, it is 4 years longer than the standard toilet warranty of any other manufacturer. Making top 5 on the list, dual-flush toilets are always a top buy. As one of the more interesting options on the list, this low-priced toilet comes in a variety of shapes, sizes and colors. Colors available are white, linen and bone; with the last color being so ‘bone’ that it almost looks yellow. It isn’t unattractive, but is a fact to note for those that are trying to color-coordinate their bathrooms. They are available in 4 styles: 10 inches (1.28/1.6 GPF) and 12 inches (1.28/1.6 GPF). The Vitreous china construction adds to the durability of the toilet, with a power wash rim that destroys any waste in the bowl with each flush. Depending on which style you get, the toilet will use 20% less water than other leading toilets on the market. The product weighs only 7 pounds and its dimensions are 25.8×19.2×29.9 inches. The only downside with this toilet is that it doesn’t come with a seat, but that makes it even more customizable. There aren’t a lot of toilets available that give customers the option of power or efficiency, but American Standard hits the mark with this one. Buyers will be able to get exactly what they want. This one has almost the same set of features as the first H2Option on the list, and is also low-priced. What differentiates the two is that this one is a right height model, so the dimensions are made to suit all users. It is a very subtle difference but it makes a big change in how the product functions, and may be a great alternative for buyers with one bathroom in a home with many members. Colors available are white, bone and linen; and the bowl sizes you can choose are elongated and round. Choosing round or elongated won’t affect the right height settings, and it retains maximum comfort even if you choose the smaller round size. A seat isn’t included with this model, so for maximum comfort some users have gone out and purchased soft seats. This ADA-compliant model has a chrome-plated top-mounted push button actuator that lets you flush using either 1 GPF or 1.6 GPF. With the jet-powered siphon, the bowl gets thoroughly cleaned no matter how much waste is in it. With the preassembled parts in the proprietary speed connect system; buyers can have the toilet installed in less time than standard toilets. As a nice option to the other H2Option on this list, this right height toilet is definitely one of the best. Last up is the Cadet 3 that is sold without a seat, allowing buyers to choose one that suits their taste. It’s just like the other Cadet 3 on the list, but this one isn’t elongated. Colors are white, linen and bone—the usual American Standard colors. Even with its different dimensions, no space is lost getting this bigger model. It not only fits in the same space as a round-front bowl, but it takes away the fear of being constricted while sitting. This WaterSense-certified product uses 1.28 gallons per flush and won’t disappoint customers with its power and efficiency. Dimensions are 28.5×15.5×28.5 and weight is 10.16 pounds, making it a very sturdy toilet. The limited 5-year warranty will be more than enough to pique the interest of cautious buyers. Vitreous china with the usual Everclean surface keeps bacteria at a minimum and makes cleanup a lot less frustrating. Consumers that have trouble deciding between the different Cadet versions will be happy to know that this is the preferred one, going by sales. Even if you decide to go with a different one in the series, you’ll be getting more than your money’s worth. Barely in the low price range is the popular Cadet 3, a toilet designed for comfort and efficiency. Its seat is included with the purchase and it is actually pretty comfortable, compared to the traditional seats by competing brands. It isn’t just a throwaway seat and is worth keeping for the long term, possibly even the lifetime of the product. The flush valve is bigger than standard size and comes in at a full 3 inches, perfect for combating large waste. With a concealed trapway and the siphon-action jetted bowl, you get a combination that keeps things looking professional inside and out. Pair this with the EverClean surface and you have one of the easiest-to-maintain bowls on the list. Buyers that have their own seats to attach and don’t want to use the included one will have no problem taking the included one off with the easy lift-off feature. The mechanics of the product are very well done, and because of that it only uses 1.28 gallons per flush, and is backed by a solid 5-year warranty. Add to that how well it seats all sizes, and this is probably the best two-piece toilet on the list. Consumers shouldn’t be surprised by the greatness of the Cadet 3; the entire series is one you don’t want to miss out on. Still hovering around the low price range is the Fairfield, the second one-piece toilet on the list. The sleep design of this toilet separates it from the other models on the list, and it is probably American Standard’s best attempt at a modern look. The usual vitreous china piece with an elongated bowl starts the flushing cycle with a side-mounted polished chrome actuator. Both toilet seat and cover are included with this model, and they are color matched so that things don’t look tacky as a set. Each flush will only take up 1.28 gallons of water, so it still gets the job done although it isn’t WaterSense-certified. Warranty is only for limited 1 year, so it defaults to the standard that most other brands offer for their toilets. It measures 30.9×26.6×18.9 and weighs 95 pounds. It’s a little surprising that even with all of these great features, the Fairfield goes largely unappreciated, as it isn’t one of their premier toilets. Despite how much this model is underrated; it is one of the top ones on the list, and well worth the purchase if you want something with a little flair from American Standard. Trying to follow the history of American Standard can be dizzying, so it would be easier to stick with the American Standard that was formed after the breakup of the founding companies. With the breakup and eventual merger happening in 2007 and 2008 respectively, Crane Plumbing and Elijer came together and formed American Standard Brands. The majority stakeholder is none other than Lixil Group, a Japanese manufacturer of building and housing materials. Since they are headquartered in Tokyo, you can guess who their biggest rival in the toilet market is. In 2015, the brand received a top award for “Brand Familiarity” Builder Magazine. They dominated the Bathroom Accessories category, which came as a bit of a surprise to fans of other companies. The company isn’t just limited to toilets, as they produce a complete line of bathroom solutions for both commercial and residential homes, and also kitchen products. The website gives customers access to the virtual showroom from ATS, an online project designer. It is an intuitive little tool that is fun to use if you’re planning a big project. In terms of marketing, the company is always in the press; but for good reasons. American Standard is one of those smaller brands that find a way to stick around despite not being a big brand, and sometimes even manage to outsell their bigger counterparts. American Standard is not only dedicated to giving customers a great price, but with aggressive targeting it is allowing customers to have the best experience. Their models usually have the lowest cost available for a product with those features, without sacrificing quality. The price is the first great feature; you won’t find a mix of one-piece and two-piece toilets at a lower rate than the one American Standard offers. Even its top-tier models seem to come in about a hundred dollars less than competing brands. This includes newer and older models, a feat that isn’t easy to match. Several companies try to match their prices but default in quality as a result. An American Standard product is as good as a product from Toto or Kohler. With the recent award for brand recognition, prices will stay the same—as a great marketing campaign—and word of mouth will fuel sales. Traditional styles are the norm for American Standard, and that means that there is nothing too modern-looking and no toilet that looks like a square box. Sometimes, simple is the way to go, and that is a bit of a thing for the company. Products always have three basic colors and a fundamental style that doesn’t add any type of quirky designs that may render the toilet less attractive. This also helps out the first benefit: price. A lot of money can go into putting floral designs and other accents on the toilet. By keeping the finished product plain, the company passes the savings on to the customer. American Standard can also boast about its WaterSense-approved toilets having the most power on the market. The 1.28 GPF models its sells have the flushing power of toilets with twice that capacity. This is due to the larger trap size which is capable of moving masses 70% larger than the industry standard. No clogs, no worries, as everything goes down in one flush without coming back up. Most of their toilets come with a 10-year warranty, the longest in the industry. Even if the products don’t offer a decade of protection, there are still the 5-year and 1-year warranties to take advantage of. No company stands by its products quite like American Standard, and its customer service is usually very easy to reach. Customers that are putting these toilets into new homes would prefer a 10-year warranty to the industry standard 1-year limited, which offers a lot of flexibility for new home ownership. Right Height is the company’s answer to Kohler’s Comfort Height, and it does a very good job of making the toilet comfortable for people of all sizes and shapes. Right height is designed to be the universal answer for both adults and children so that they don’t put undue stress on their back when sitting on or getting up from the toilet. These Right Height toilets are optional buys, and the customer can always choose to get a regular-sized toilet with familiar dimensions. Last but not least is the speed-connect system exclusive to American Standard. Parts come preassembled so that the customer does less work getting the toilet installed. This can speed things up by 20% and save a significant amount of time for first-time installers. With as many as 14 parts that need to be handled on the drain alone, the company has simplified the most complicated part of the process by making useful videos of the process available to the public and anyone interested in the system. It’s one of the speediest and simplest setups you’ll encounter when installing a toilet. The lowest rate for quality toilets in the industry comes from American Standard, with no other notable company coming close. It has consistently beat Toto and Kohler when it comes to sales, and its flagship products can sometimes retail for ¼ the price of a mid-tier Toto model. A good way to look at the company’s price model is to compare its dual-flush toilets to that of the big brands, and you will notice a huge difference in pricing. Elongated dual-flush toilets are really all the rage now, and since American Brands has Right Height to combat Comfort Height, its dual-flush toilets are an outright steal to the savvy consumer. American Standard is a down-to-earth, traditional, no-bling type of company. It is a good alternative to the bigger companies that does a good job of not getting left behind. Buyers that opt to go with the brand will have to give up on fancily designed toilets, extra features, and a little bit of pandering to plumbers worldwide. These are still quality toilets even without all the extra features, and it becomes increasingly hard to combat a decade-long warranty. This is something that neither Toto nor Kohler can match, even though they are considered innovators in the market. It’s one of the better deals you can get with a toilet, and one of the main reasons to consider buying a product of the brand’s. There’s some downside though, to only being able to select neutral colors like bone, white and linen. These are indeed boring colors, but they are the best colors that go with any bathroom, regardless of color scheme. Installation is easy for beginner customers, thanks to the Speed-Connect system; a feature that matches even Kohler’s best. It’s an uncomplicated way to hook up a toilet, and one that other toilet manufacturers should copy. Whether you’re installing a two-piece or one-piece toilet, it will be an easy encounter thanks to this tested-and-tried system. The vitreous china used to make each model does not differ, and that applies to all toilets by all manufacturers. Models sold by American Standard are as durable and strong as the top models from Toto. So if you aren’t a big feature person and toilet design isn’t really your thing, the American Standard brand is exactly where you should focus your buying attention. That purchase will be one of the best you’ve ever made for your bathroom. This concludes the list of best toilets in American Standard’s lineup, which are only a sample size of what this great company has to offer. While a lot of companies would have buckled under the pressure of a merger, American Standard continues to thrive in an industry where it sells some of the best products on the market.